NOW, THEREFORE, be it resolved that we, the Town Council of the Town of Amherst in the Commonwealth of Massachusetts, do hereby recognize 2019 as the 25th anniversary of the Amherst Education Foundation, and honor its mission to support Amherst area public schools in providing a challenging and enriching educational experience that maximizes the learning potential of every student and prepares them to succeed in the 21st century. IN WITNESS WHEREOF, WE the Amherst Town Council have hereunto voted and set our hands this 1st day of April, 2019. Tickets are now available for our spring celebration! 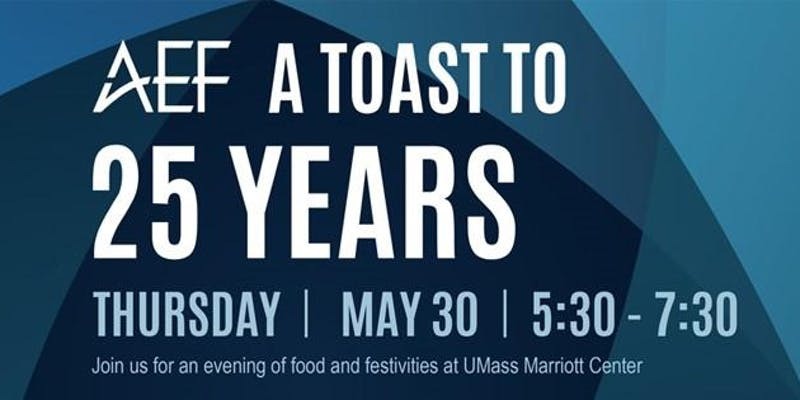 We hope you can join us on Thursday, May 30, 2019, for a festive evening of fun!Our special guests include AEF co-founder Ellen Story, Senator Jo Comerford, Representative Mindy Domb, and Amherst Town Council President Lynn Griesemer. The evening will feature cocktails, hearty appetizers, and a fun and unique silent auction. Doors open at 5:30 p.m. See you there! AEF is an independent, non-profit organization committed to promoting students’ educational equity, supporting diversity, stimulating excellence, and mobilizing broad community support. Amherst Education Foundation (AEF) supports Amherst area public schools* in providing a challenging and enriching educational experience that maximizes the learning potential of every student and prepares them to succeed in the 21st century.